OUR PRICE: $62.90 - Join Rewards Get $6 Dance Dollars On This Item! I had to poke holes in the straps. The instructions say to order a half size larger so I ordered a 9. It is loose, but wearable. I'm only using them to teach a song for our musical, so I am good with keeping them. When I adjusted the straps they don't slip up and down, so all good. Nice sound and quality shoe. Like Goldilocks... Too big... Too small. I read the different reviews about size and because a 1/2 size larger than my shoe size was not available, I chose 1 size up. It was way too big! Then I ordered my street size figuring that one size up was so huge, that maybe my size would work. It didn't... too small. So, I had to order my 10 1/2 from another site. This company was very fast on the shipping and refund. They have excellent customer service, so I would definitely buy from them again. I would recommend going 1/2 size up from your shoe size if ordering. The taps sound very nice too, and I love the Cuban heel. Good shoes for learning tap. 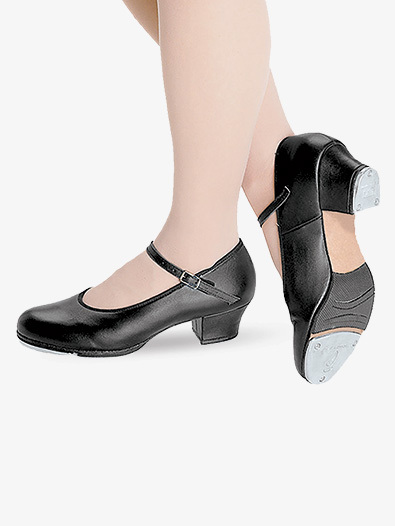 Had Capezio 2" narrow heels, however, I found them difficult in which to balance.The Bloch Showtapper S0323L were recommended to me by someone in the advanced tap class because the heels were wider. The Bloch's 1.5" heels are high enough and help me greatly with balancing. Had to order 1/2 size up, because they run short. The Capezios are more comfortable, however, I added a padded insole and a padded dance insole to each shoe and that helped the comfort level greatly. I also like that they have self-locking straps. They're easy to put on and take off. These are now my main tap shoes and I definitely recommend them. These shoes do what they are supposed to do, tap. However, they run very small (I had to order a full size larger than street size and they are still rather snug), the style is rather wide with a fat heel which is less than aesthetically pleasing (by that I mean UGLY!) and it doesn't have quite enough arch support for my liking. They do produce a good sound and are fairly durable though. Wore twice and no more...got corns on my toes. Weird fit. From the other reviews, seems to do well for some. I'm having to give them away as I've worn them. Still looking for a comfortable tap shoe. Any suggestions? I fell in love with this style of tap shoes. I always buy them no matter what. We have had 3 pairs of this item. The sound of the taps is great, however, the shoe itself does not hold up well. The straps break easily and we have had two of the front metal taps crack. For the last 5 years, I've tapped in these shoes (our teacher required them). They're SO comfortable, tap well, and are just an all around great shoe (my current pair has lasted for over 3 years with minimal damage - a little of the traction pad wore off, but not enough to make a difference). However, they're not so great for doing toe stands - it's pretty much impossible, actually, so if you do a lot of "toe tricks", these aren't for you. Now, we're being asked to get the Bloch Tap Flex - if they're half as good as the Show Tapper, I'll be satisfied. I love these taps! They look stunning onstage and they're just awesome. They are my first pair of tap shoes, but in the past I've had to break in Irish Hard Shoes. Warning--these hurt a lot to break in. They're tap shoes, for one thing, and they're character shoes as well-enough said. Once broken in, they're awesome shoes and they sound really good. Recommend for everyone! One word to describe: beautiful. Fabulous sound, long lasting. Do not follow size chart. Order up to 1 to 2 sizes up. I used them for two years no prob! Will order again. These are great shoes! I ordered a 1/2 size larger than usual due to the reviews, but they were too big. If I was wearing them in a class, with socks, they'd fit fine. But for a show, with tights, I need my regular size. I was so excited to get my new Blochs to use for my first day of tap. I had tapped around the house to see how they felt and I really like them. I especially like the sturdiness of the Cuban heel, since I'm pretty chunky and tap for fun and exercise. Anyway, I was buckling my shoes at the studio for the FIRST lesson and my strap TORE apart. It did not come unsewed from the shoe, it ripped in half as I was trying to buckle it. I wasn't too happy about it and, of course, couldn't send the shoes back because I had already used them. This is the first pair of Blochs I've ever owned and will probably be the last because of the questionable quality. My Capezios lasted for 6 years with no problems! This was not what I expected from a brand new pair of shoes. So disappointing! Unfortunately, the sizing varies with this style: some order 1/2 size up and others 1 full size up. My best suggestion would be to purchase two and return the size that did not work.